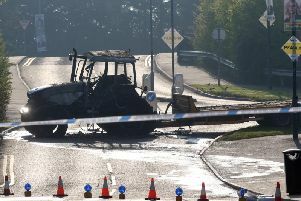 The scene of a road traffic collision in Lisburn. Source: PSNI Lisburn Facebook. Lisburn police officers out on burglar patrol came across a scene of debris on a local road in the early hours of Saturday morning. They have claimed that a smashed traffic light was caused by a drink driver who was allegedly twice the legal limit. Lisburn PSNI shared the information on their Facebook page, they posted: “In the early hours, one of our anti burglary patrols came to a junction and discovered this scene. “The remains of the traffic light you can see had been dragged across two lanes onto the central reservation, and only the crash barrier had stopped this vehicle from ending up crossing another two lanes. “As is standard with Road Traffic Collisions, we conducted a breath test on the driver at the side of the road which he failed. “Cue his arrest and a trip to Musgrave Custody Suite for an evidential breath test which showed he was TWICE the legal limit.